In an unconference style untalk, Rebecca leads a dynamic discussion including the context, intent and perspectives of student journalists. Download the MP3 (time: 1:09:18). Jay Rosen joins us at The Berkman Center to talk about Open Source journalism and his new project, www.newassignment.net. Download the MP3 (time: 1:19:42). The Berkman Center for Internet & Society hosted “Liveblogging the 2006 Election” on Tuesday, November 7 (Election Day). 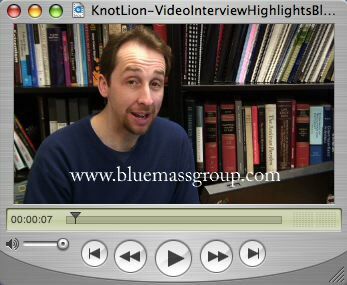 Blue Mass Group set up in the Berkman library and VideoBerkman correspondent Indigo Tabor caught up with them for a conversation. A few minutes with these smart folks and it is easy to understand why their political blog is so popular in Massachusetts. This short video interview with David Kravitz, Bob Neer, and Charley Blandy was produced by Indigo Tabor. Click here to view the full-length interview over at blip.tv. Special to AudioBerkman : This podcast from the Center for Citizen Media features a conversation with Travis Henry of Yourhub.com. Yourhub allows residents of the Front Range region of Colorado to sign up to post their own news items and photos. Travis also touches on efforts to syndicate the technology that powers Yourhub to other media organizations. Produced by Lisa Williams for the Center for Citizen Media. Attribution: Music from this episode of the Center for Citizen Media Podcast was sampled from a track by Revolution Void, titled “Accelerated Lifestyle”. Ethan Zuckerman, co-founder of Global Voices Online, which helps “amplify, curate and aggregate the global conversation online.” Ethan will lead a discussion on how citizen media people can make themselves heard amid all the online noise. AbovetheNoise session description… From the Citizen Journalism Unconference 2006 proceedings at Harvard Law School. Phil Malone, co-director of the Clinical Program in Cyberlaw at Harvard Law School. He’ll lead a conversation about citizen journalists and the law, including seeking to better understand areas in which the activities of citizen journalists are being chilled by legal concerns and ways in which they could benefit most from help in avoiding legal trouble. Here’s Phil’s summary. From the Citizen Journalism Unconference 2006 proceedings at Harvard Law School. Tom Stites, whose recent speech on media and democracy has raised such interest, on how (and if) citizen journalists can fill the enormous gaps being left by traditional media organizations. Here’s his introduction. From the Citizen Journalism Unconference 2006 proceedings at Harvard Law School. Steve Garfield, a top videoblogger, on using multimedia tools for better citizen journalism. Here’s his summary of what he plans to cover. 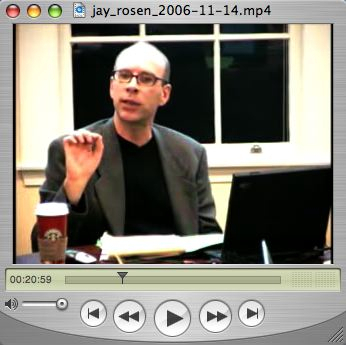 From the Citizen Journalism Unconference 2006 proceedings at Harvard Law School.